﻿We can't wait to meet you! Please complete these forms so we can expedite your first visit. You may send the completed forms to records@youngdentalgroup.com or bring a copy to your visit. Oral Cancer Screening, Periodontal (Gum) Examination, Tooth-by-Tooth Survey and Charting, Photographs, and Digital Radiographs (X-rays) as needed. Please let us know if you'd prefer to also have Prophylaxis (Teeth Cleaning) at your first visit. If you've had dental X-rays taken recently, kindly send them to us before your visit. They can be e-mailed here. Let us know if you have a specific dental concern or emergency when you make your appointment. For your convenience, we accept all PPO dental benefit plans. We will do our best to help you understand your dental benefits and make any co-payments easily affordable. More info on dental benefit plans can be found here. Please take a look! Invite your friends to check us out! Share their contact info and we'll take care of the rest! Dr. Cu and her sister Cat built an education site Teeth.Life in association with their product Cocofloss. Any other questions, please don't hesitate to ask! Greetings, inquiries, and knock-knock jokes go here. 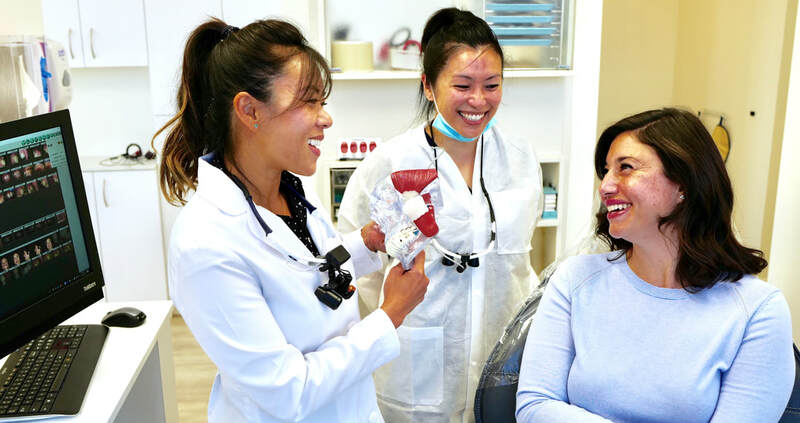 Family and Cosmetic Dentistry serving San Mateo, Burlingame, and the San Francisco Bay Area for 32 years!